Whenever you listen to songs in genres like rock, jazz, pop, blues, and heavy metal, you would always hear an instrument with a very low tone. This is the bass guitar. This instrument provides a backbone to your song. It holds down the rhythm of the music, giving it a greater impact. This instrument is exciting to play with, but players on a budget might find it difficult to look for a good bass guitar. Luckily, you could opt for the best bass guitars under $500. While the prices of these bass guitars may be low, you can still perform a killer bass solo with these basses. Think of songs like Queen’s hit entitled, “Another One Bites the Dust.” Who would not die for that killer bass line, right? Indeed, your talent would blossom further without investing on a lot for your instrument. Let’s get it on, then. On this article, we are going to identify ten of the best bass guitars under $500. Moreover, we will list down the characteristics which each of the products possesses. If you want to see our beginner bass guitars, check out our beginner bass guitar reviews here. 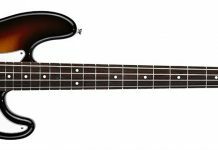 One of the first things that you have to do as a bass guitarist is to detect the characteristics which should be present on typical bass guitars under $500. This way, you will be able to choose the right instrument that would be suitable to your needs and budget. Here are two of the features that you should look for when picking the best bass guitars under $500. 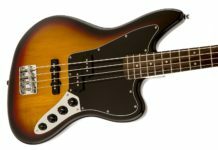 One specific thing that you must take into account when looking for bass guitars under $500 is the material that was used. You should note that the wood used for the bass guitar would affect its weight and tone. Bass guitars which are built using mahogany, for instance, are known to be warm. Maple bass guitars, on the other hand, produce a bright and crisp tone. Alder and ash are comparable tone woods which provide a balanced overall tone. You should also consider the fingerboard of your bass guitar. A coated fingerboard would help create a fretless sound and a longer sustain. This feature would wear much longer when you use it with round-wound strings. On the other hand, an uncoated fingerboard has a warmer and more natural sound than the former. 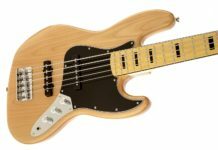 The features which were mentioned above are just some of the key features that you should take into consideration when picking the best bass guitars under $500. You should be able to note that the end choice would still depend on your preference as the player. To begin our list of the best bass guitars under $500, we have the Dean Custom Zone Bass. This instrument features sensuous curves and great playability that would make this instrument a must-try for any player. This product features a radical nuclear green body color with matching neck. In addition to this, it also has a lightweight basswood body. Its fingerboard and neck are made up of maple. Other features include a bolt-on neck, black hardware, split pickup, and sealed die-cast tuners. The Sterling by Music Man StingRay Ray4 Bass Guitar is another great choice. Its body is made of basswood. Its neck and fretboard, on the other hand, are made of maple. This bass guitar includes a ceramic pickup and two-band active preamp for volume, treble, and bass. Other features include a 3+! tuning key arrangement, humbucker pickup with active electronics, and a 6 bolt neck. By using this instrument, you could ensure a high quality yet affordable build for musicians of all levels. Yoshioe Electric Bass Guitar is an electric bass guitar with elegant colors, perfect for performances. This bass guitar is made of high-quality rosewood and basswood materials. It has a comfortable hand feeling and a stylish sound. It also brings out the best in any musician because of its stable performance and its melodious sound. Compared with other bass guitars under $500, this particular instrument has larger string tension and thicker strings. It has a silky balance to the tone, supporting vocals beauty. The Dean Edge 1 5-String Bass is a classical bass guitar with a light basswood body that is styled for comfort. Its 34-inch maple neck is designed for a sleek feeling. It has a custom design heel and neck joint along with a four-bolt pattern. These custom features create uninterrupted access all the way to the rosewood fretboard. Cosmetic touches include abalone dot fingerboard markers and chrome hardware. It also consists of a gloss finish, making it more enjoyable to play it. When looking for stunning yet efficient bass guitars under $500, then the Ibanez GSR206BWNF 6-String Electric Bass might just be the right one for you. This bass guitar is popular because of its punch tone and remarkable playability. It has a compact mahogany body and a slim neck profile, giving you impressive speed and comfort. The bass guitar further consists of a mahogany body, a rosewood fingerboard, and a maple neck. When you buy this product, you would also receive a gig bag and a stand. The Safeplus Electric Bass Guitar is one of the best bass guitars under $500 for beginners. It features a full-size cutaway dreadnought body for a vibrant tone. Because of this, you could play all styles of music in a rich and bright sound. The fingerboard and the body of this bass guitar are made of paulownia and rose. It further features a gliding fret, precise chord distance, and comfortable strings. This bass guitar comes in a set which includes a guitar bag, a strap, a guitar pick, and an amp cord. The Ibanez GSR206 6 String Electric Bass offers playability and comfort right at your fingertips. It features solid six strings, adding versatility and range to the bass guitarist. In addition to this, this bass guitar also features an Agathis body, one-piece maple neck, chrome hardware, and Phat-II EQ. When you purchase this bass guitar, you would also get the chance to have a stand and a gig bag. We have also included the Shecter 2522 STILETTO STEALTH-4 Bass Guitar on our bass guitars under $500 list. It offers beautiful tones which are capable of filling any mix. So whether you are playing jazz or rock, you could bring out the best in your using this instrument. The rosewood of this bass guitar is made using rosewood. In terms of inlays, this instrument features grey Pearloid Dots. When you buy this instrument, you would get to have with you a hard shell case where you could place your bass guitar. The Ibanez GSR105EXMOL 5-String Electric Bass gives you the tone and playability that you need at a low price. It also provides you with a comfortable feel due to its compact body. You will surely love its slim-profile maple neck which offers a balance of speed and playing comfort. This bass guitar further features a B15 bridge, medium frets, a passive bridge pickup, and an SR body style. When you purchase this bass guitar, you will also receive a gig bag and a tuner. The Ibanez GSR200BLWNF 4 String Electric Bass completes our list of the best bass guitars under $500. Not only does this model look better, but it also allows you to play better than everything else in its price range. With its set-up and features, it could be comparable to other much expensive bass guitar models. When you purchase this product, you could also receive a tuner, a gig bag, and a stand. As we have mentioned earlier, bass guitars serve as the backbone of any musical piece – whether it be rock or jazz. Hence, you should choose this type of instrument carefully and intricately so that you could have a stellar performance. You should then scrutinize each of these products well so you could arrive at their key characteristics. And when it is all said and done, you could already purchase your chosen one among the best bass guitars under $500.